A Boy From Tupelo: The Complete 1953-1955 Recordings is the definitive collection of Elvis’ Sun-era recordings in one comprehensive package. 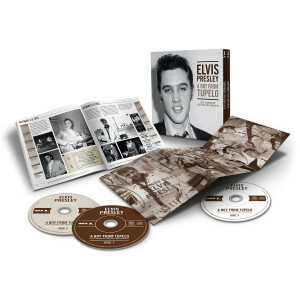 A Boy From Tupelo: The Complete 1953-1955 Recordings includes on 3 CDs every surviving Elvis Presley Sun master and outtake, plus two private records Elvis paid with his own money to record, as well as all known radio- and concert performances from the period. Many of these recordings are rare demos, session takes, and live performances including a newly discovered and previously unreleased recording of “I Forgot to Remember to Forget” from a 1955 Louisiana Hayride performance. The accompanying 120-page book compiled by Elvis authority Ernst Mikael Jørgensen and is, in essence, a fully-illustrated travelogue. It details the birth of Elvis’ career through facts, anecdotes, documentation, many rare photos, and a succinct narrative. Independence Day 1954 is when this uniquely American saga begins, less than 24 hours before his first professional recording session, and it ends in December 1955, when the rights to Elvis’ Sun tapes officially expire and the singer leaves Sam Phillips and Sun Records to record for RCA Victor. This is the story of Elvis Presley before he becomes world-famous, and how this amazing young man readies himself for stardom, achieving success on a level that no one could have dreamed possible. The photos in the book are very interesting but it is VERY difficult to read because the printing is so tiny. I received my set of A Boy From Tupelo: The Complete 1953-1955 Recordings and I thought it was O.K. It sounded very different because it was younger Elvis. He sounds a lot better later in life. Beautiful 3 CD box set. If you have the complete Sun Sessions and Louisiana Hayride then you have the essence of disc 1 and 3. Disc 2 is takes, outtakes, snippets of dialogue. However there is too much dead air on this disc that could have done with better splicing. The book is the standout! Gorgeous photos! Detailed calendar of Elvis' weeks from beginning to end as a Sun Studio artist. It's been difficult to collect all the official Sun issues in the past, with all the different packaging, rechannelling and lost master tapes. This collection does just that, and then some. At an affordable price you get all known available Sun recordings, issued or otherwise (at least I hope so!). The highlight for me is the official issue of "That's All Right" in all its dry, non-echo excellence. The remastering puts you right in the recording studio in the late night hours of July 5, 1954 (early morning July 6?). This one-stop shop item should be Step Number 1 for anyone wanting to learn and appreciate Elvis Presley's recorded legacy! Ernst Jorgensen is a genius, and has the job that I would kill for! First I turned 65 and now I have the best of E.P. ! Also,the accompanying booklet is superb !